Chizarira National Park is too good to miss. 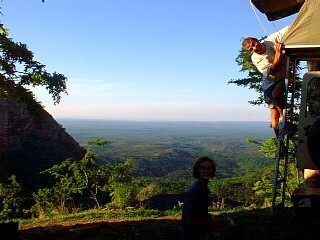 The spectacular Mucheni View campspot is probably one of the best campsites in Africa - closely followed by Busi. Back into Zimbabwe and at Vic Falls we quickly stocked up on a few provisions and fended off the local street traders before jumping into the Inyathi Campsite swimming pool at the earliest opportunity. That night we put some Christmas decorations up in Punda and Comets rear windows. Before the journey to Chizarira National Park we bought the goodies for the 'first' Xmas dinner - turkey, stuffing, Xmas pudding etc. etc....The piece de resistance though was the fairy lights! The Lions Den Camp near Hwange was perfect for our steak braai that night illuminated by the flashing fairy lights in the back of Punda. Tacky or what! 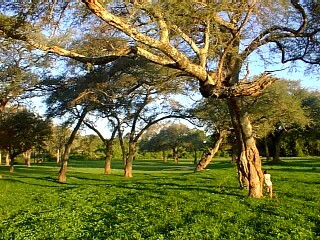 In the morning the route towards Binga and then to Chizarira was beautiful and the colours reminiscent of West Africa. Passing stick and mud huts and children wearing rags brought back memories of a few months ago, as did the animals wandering in the road. For the first time in ages we had an audience whilst eating lunch too. Chizarira is one of Zimbabwes most inaccessible parks and consequently is the least visited. Its pristine condition surprised us all over the next few days and its hidden treats were just awesome. The Zimbabwe park officials are gentle and very friendly - a complete contrast to those in Botswana. We paid our entrance fee of US$20 per person which allows for a stay of up to six days. Camping is £5 per site per night and you can cram hundreds of people into a site if you want to. We chose Mucheni View as our campsite for the night as we had read of its spectacular view. When we reached the site our jaws dropped - we were unprepared for such magnificence. On the edge of an escarpment with a very long drop and views forever, Mucheni View was the most impressive camp site we have ever visited. Almost instantly we all agreed that this is where we wanted to be on New Years Eve. We would have to make a 5000km round trip from Cape Town but it would be worth it. 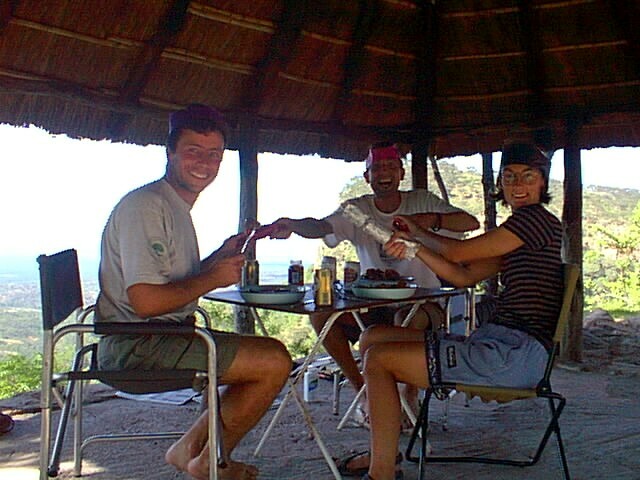 We sat under the lapa (thatched roof shelter) staring over miles of beautiful Zimbabwe, past Lake Kariba and on to Zambia. 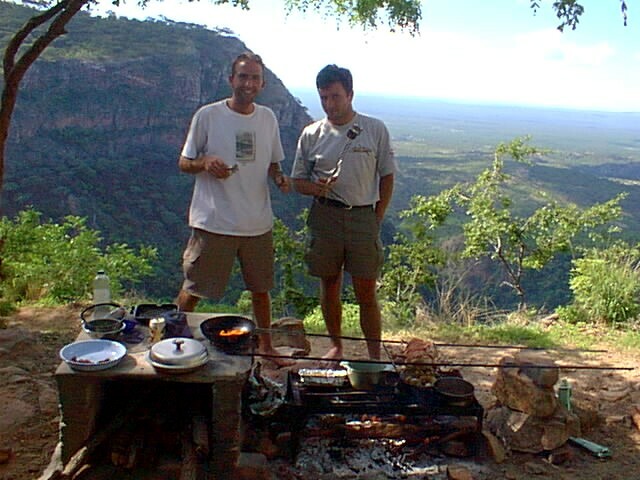 That night we had yet another braai, polished off a bottle of gin and half a bottle of Amarula - South Africas equivalent to Baileys which according to a recent survey in The Telegraph is popular with the oldies! 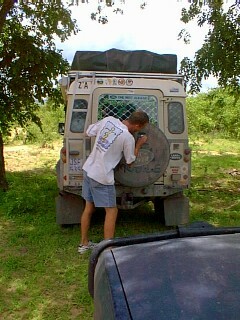 The next day was spent on a game drive to the campsite at Busi. The park is outstanding with beautiful scenery and animals galore. We had been told that we would have to camp at the Busi overflow site as the main Busi site was inaccessible unless we wanted to swim with the cars across the Busi River. That sounded more like a challenge than a warning to us mad nutter 4x4 experts! In fact, the riverbed was practically dry and had a sandy bottom so we crossed it easily. Thank goodness we did. Busi main camp is in a beautiful green meadow and hundreds of impala with their babies were skipping through along with warthogs, zebra and ..... elephants. We decided to climb a tree with our camera kit and watch the elephants in the distance. This turned out to be one of the most exciting but stupid things we have ever done! The elephants did not stay in the distance - they moved towards us. Their eyesight is not too good so they probably failed to notice our forms which became stiller and stiller with their approach. At first it was great. They reached the waterhole 30 m away and we watched with excitement. At 20 m the cameras and videos were put down and were ready to be abandoned as self-preservation became top priority. The last vertical branch was the only option but the elephants quickly got closer. 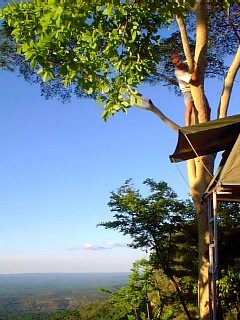 At 10 m it was too late to climb higher up the tree so we clung frozen to the branches hoping not to be charged. The elephants knew something was not quite right but didn't seem too bothered and continued munching on the grass. I have never shaken so much in my life. The big ones approached us whilst the young ones stayed at the back. We found ourselves whispering "thanks very much chaps, it has been great but you can go now ....please...go now". They could have probably heard our heartbeats at this point. We were at head height with the elephants and didn't know what was going to happen next when Andrews foot slipped. Aaggghhhh. Their trunks shot high into the air as the trumpeting sound shook the tree then they were off. Thankfully our close encounter with the elephant kind had come to an end. We had survived. What an experience. Next time we would choose a higher tree! The excitement was tinged though with the feeling of sadness as we had obviously upset the elephants in their territory. Friday 17th was to be our Christmas day with Gordon. We returned to Mucheni View for a day of merry making. The fire was lit and three hours later we had roast turkey, roast potatoes, stuffing, cranberry sauce, sausages with bacon, a selection of vegetables and Xmas pudding. It was fantastic - easier than cooking it in the kitchen at home. We even had crackers and hats. This must be one of the most spectacular venues for a Christmas nosh. 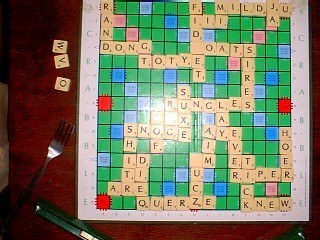 Played a bit of scrabble - double points for rude words, but had insufficient booze to fall down the escarpment despite Gordons attempt whilst retrieving something he'd dropped! Next day it was back on the road to Bulawayo. We chose to take the scenic route passing beautifully-kept villages with mud huts painted in earthy colours. Whilst driving over bridges the locals offered us fresh fish. It was so good to be back in what feels like the true Africa and this time we could converse with the locals. We were delighted to get back to some roadside fruit and vegetable purchases too. That night we had dinner out and discovered that the local pub closes at 10pm! So much for Zimbabwes second largest town. After a mornings shopping in Bulawayo we said "bye" again to Gordon as we set off to Cape Town. 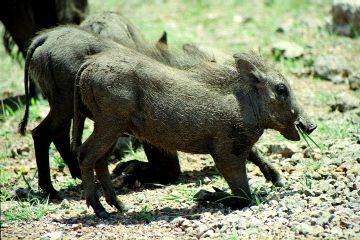 Baby warthogs on the side of the road - cute man Gordie spots 'Deil Mobile' written on the back and tries to rub it off Gordies plan for avoiding elephants Mucheni View, Chizerira. To die for, eh Gordie !